Two days before Christmas, and all is hustle and bustle at the little house in the big woods. 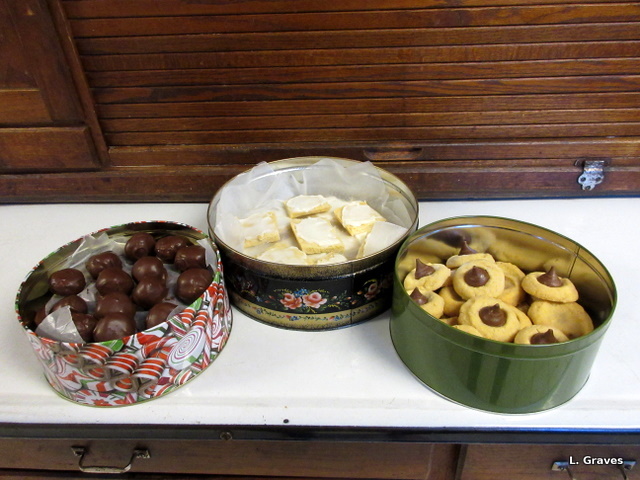 To date, I’ve made peanut butter balls, frosted shortbread, and thumb-print cookies. Later this morning, as I listen to the last Diane Rehm show on NPR—I’m going to miss her!—I’ll be making chocolate chip cookies for when the kids and the two dogs come rolling in tonight. Oh, what a lively household it will be, and how I am looking forward to having them all here. 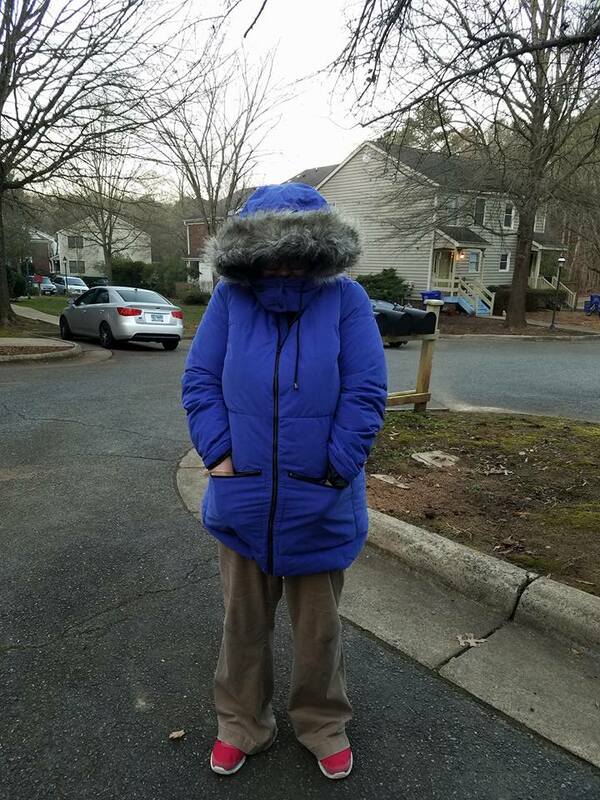 Here is a picture of Shannon, in a Maya-blue coat—no, we did not coordinate—at the beginning of the trip from North Carolina. She looks like a friendly version of Scrooge’s ghost of Christmas Future, doesn’t she? Happy Christmas, happy New Year, happy holidays to all! I will not be posting until 2017 so that I can spend time with my family. I hope your celebrations are filled with merriment and good food. Previous PostA Snowy DayNext PostHappy New Year, 2017! May you enjoy a wonderful time with your family and friends. Happy holidays! Thanks, Carina! And happy holidays to you and yours. I’m all ready for the cold!! :p See you tonight!! Right, right! See you soon! The cookies are made, and I’ll have the kettle of water heating for tea. Our boys (27&29) are here and it’s wonderful. Yes, so wonderful to have our children with us for the holidays. Merry Christmas to you, too! Thanks, Judy! Hope your holidays are filled with merriment and good food. Happy Christmas, Happy New Year to you and your family too, Laurie. And throw some of those yummy cookies over here, okay? Our family is spending the holiday in Los Angeles again. Judy and I came in yesterday, now we are waiting for the kids to arrive – their flights are delayed, naturally. Your baked goodies look scrumptious! So far Judy has made a big batch of chex mix, but more goodies are to come. Just when we need her most Diane Rehm is leaving us. I will miss her, too. Have a wonderful holiday time with your family, Laurie. Thanks, Brenda! Happy holiday to you and yours! Have a wonderful Christmas with your family, Laurie. I definitely do like that Maya-blue color! Many thanks! To me, Maya blue is beautiful.